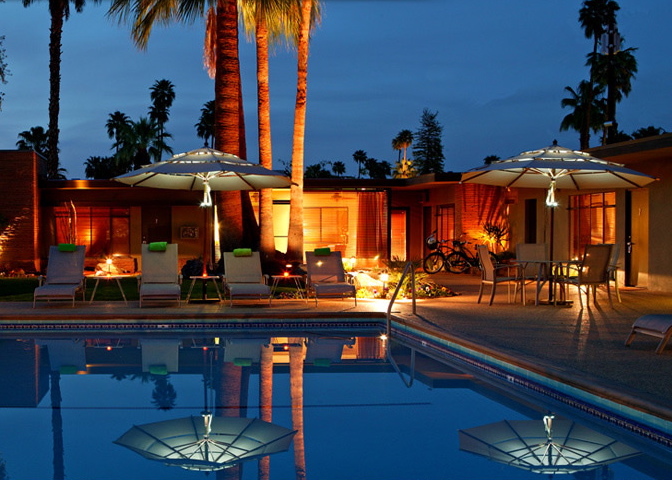 Palm Springs has a wonderful collection of beautifully restored and thoughtfully run small resorts that were designed by noted modernists. 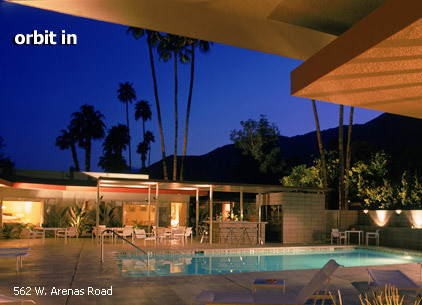 Make your visit to 'modern' Palm Springs complete by choosing a resort that reflects the understated sophistication and friendly glamour of the city's Hollywood heyday. 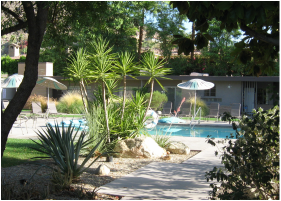 Below you'll find a selection of small, independently owned and operated friends and partners, or click the "More Resorts" button for a complete list of lodgings in the city of Palm Springs. 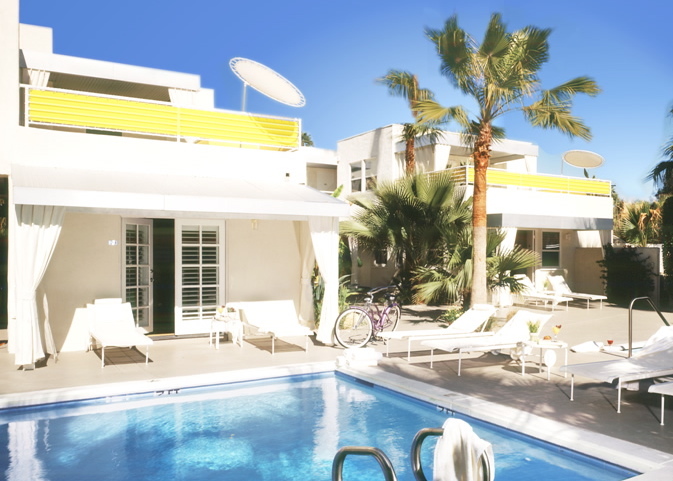 Orbit In to the Palm Springs modern vibe and leave your worries behind as you lounge in luxurious mid-century style. 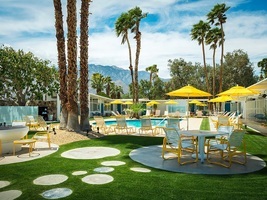 Breathtaking mountain views, poolside breakfast, cruiser bikes and cocktails - all served up at a small boutique hotel where vintage modernism meets the 21st century. Ideally located in the Palm Springs' historic hotel and shopping district, and only one block from downtown Palm Springs, the Del Marcos offers accommodations that perfectly capture the elegant but relaxed sophistication of the mid-century desert resort lifestyle - one of Palm Springs' most distinguished architectural landmarks. Looking for a romantic, elegant escape steeped in enough mid-century architecture and style to bring out your inner Sinatra? Orbit In to the Hideaway - a partner property to the Orbit In, just steps away on West Arenas Road in the heart of Palm Springs' Historic Tennis Club neighborhood. ​The Monkey Tree Hotel is a private 16 room boutique hotel nestled against the backdrop of the gorgeous San Jacinto Mountains on a large one-acre property. The hotel was restored and renovated to its mid-century modern design and re-opened in February 2016 by owners Gary and Kathy. Use of the Scandinavian spa (whirlpool, dry sauna and cold plunge) along with a delicious home-made breakfast is included. 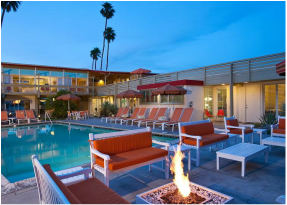 The Movie Colony Hotel, named for its Hollywood star-filled neighborhood, combines iconic mid-century modern architecture with luxury, comfort and simple elegance in its décor. Stylish, private, comfortable and laid-back, the Movie Colony offers you a home away from home, just steps from downtown Palm Springs. The Desert Riviera Hotel has always catered to guests craving a romantic retreat, a gathering of close friends, or anyone who just wants to slow down and catch their breath. Still others love it for its spectacular mountain view and luxurious amenities. Our gracious and friendly host, Judy, will make you feel as if you’re part of the family. This page is growing with more great architectural accommodations to come. Please check back for updates.